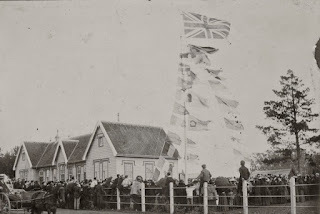 Ref: Flying the flag, Otahuhu, 11 August 1900, photograph reproduced courtesy of Otahuhu Historical Society, South Auckland Research Centre,Auckland Libraries, Footprints 03721. 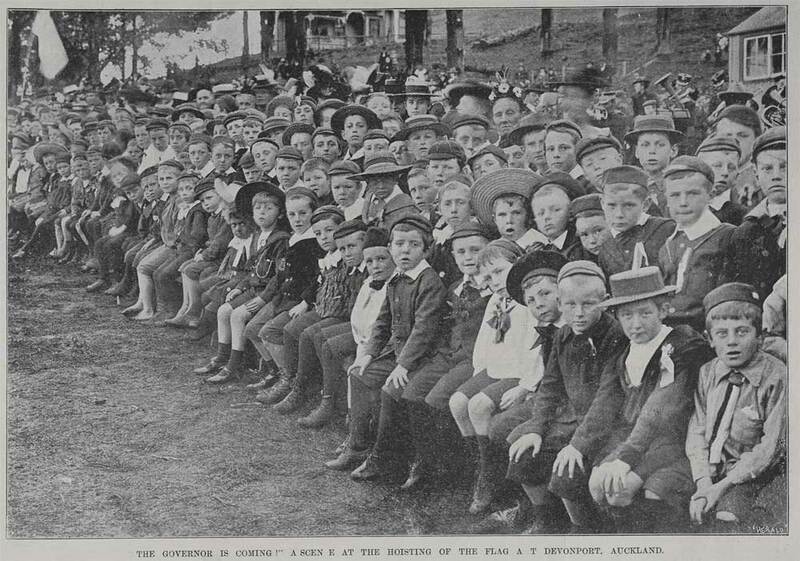 The South African War saw a marked increase in these ceremonies. 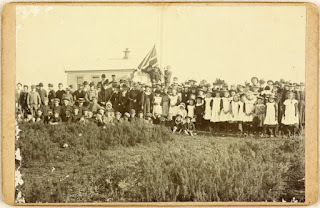 Schools acquired Union Jacks and flagstaffs either by donation or by fundraising. These formal ceremonies at schools were very well attended by parents, students, teachers, visitors and others in the community. Ref: Unfurling the flag, Otaua, 13 September 1900,photograph reproduced courtesy of Waiuku Museum Society, South Auckland Research Centre, Auckland Libraries, Footprints 06448. Ref: Auckland Weekly News, p.4, 22 June 1900, Central Auckland Research Centre, Auckland Libraries, A+H SERIAL 072 W39. There would be patriotic speeches by dignitaries, the official “hoisting of the flag”, bunting, men in uniform, everyone singing the National Anthem and sometimes also “The United Nation”, “The Red, White and Blue” and “The Union Jack of Old England”. 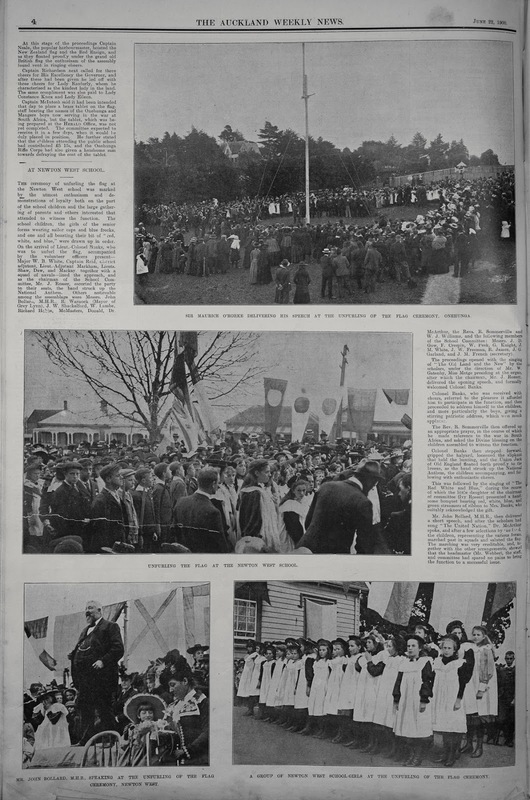 Later on it became popular to salute the flag during the ceremony. Formalities would usually be concluded with enthusiastic cheering. 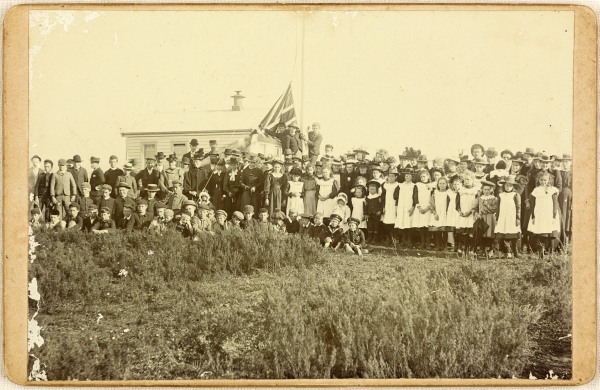 Ref: ‘The Governor is coming’ at the hoisting of the flag at Devonport, 30 May 1900, Sir George Grey Special Collections, Auckland Libraries, AWNS-19000608-1-1. If you’re interested in more flag images, they can be found on Footprints, Heritage Images and Papers Past.